End the season with a Deadly Strike | See the latest and colourful adidas pack! Be colourful and unpredictable. Become one with your surroundings and strike without getting noticed. Be victorious on the pitch and street, or even in the cage. Seize your Deadly Strike and end it all with only one touch to the ball. adidas welcomes you into the jungle with their latest and colourful Deadly Strike Pack. Get inspired by the deadliest predators of the jungle! We are heading into the last part of the season. It is time for you to be the game changer and the player who will be remembered for eternity. Be different and noticed in this great colourful pack from adidas. The Deadly Strike Pack is inspired by the most colourful and deadliest predators of the jungle! The colourway is so well-done that it is going to make you stand out on the pitch, so you will be noticed by the blink of the eye. Now is your time to be the difference and be the one who is here to create! 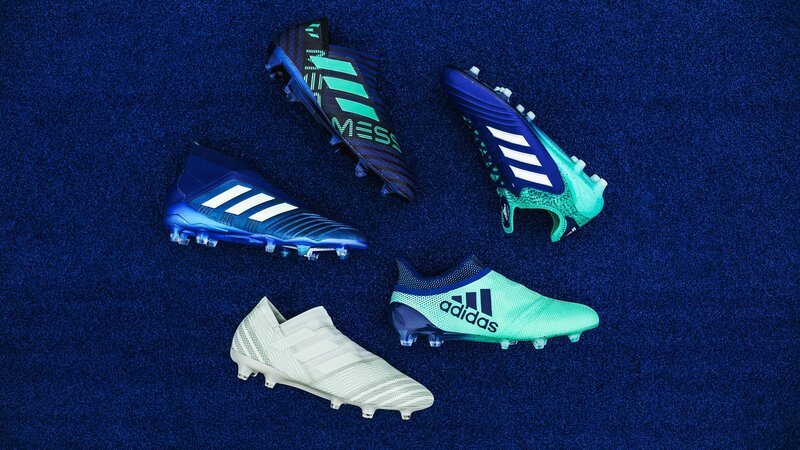 The adidas Deadly Strike Pack is going to be worn by all adidas pro players on pitch, so you can expect players such as Dele Alli, Mesut Özil and Paul Pogba to wear their Predator 18+ in the new Deadly Strike colourway. The Predator 18+ Deadly Strike is made in a royal blue colour with the well-known three strips in white on the side. The Predator is still the same as the Cold Blooded and Skystalker when it comes to tech, so the only new thing is the sick colourway. The Predator 18+ still offers the same maximum surface control due to the Purecut Laceless system, and medial and lateral stability with the Forged Knit integration in the midfoot. BOOST™ still plays a huge part in this boot, so you still get the BOOST™ midsole, Primeknit Sockfit, Controlskin and an Anatomical Upper, so you still get the Predator feeling in a new and vibrant jungle themed colourway. The adidas X 17+ just looks even faster than before with this new mint blue colourway, with added royal blue details. The X is tech-wise still the same as the previous colourways and is built for the most lethal and fastest players of the game. Try imaging Luis Suárez, Mohamed Salah and Paulo Dybala running around in scoring vital goals and securing important point, with a Deadly Strike! Let’s finish off with the two Nemeziz boots of the Deadly Strike pack. As all the other boots they will also stay true to their predecessor’s tech-wise. The Nemeziz still offer an enhanced performance to the most Agile players of the game. The Nemeziz 17+ 360 Agility Deadly Strike is the only boot made in a different and special colour, and differs from the rest of the pack, which are kept in a royal and mint blue combo. The Nemeziz colour might be the sickest colour of the pack, and you are guaranteed to be spotted on the pitch with this one. We can’t wait to see Firmino and Immobile running around and making the defenders dizzy before ending with a Deadly Strike in front of goal. Furthermore, Nemeziz 17+ 360 Agility Messi has also gotten an updated paintjob and seems even sicker than the previous Cold Blooded. Looks like Messi is more than ready to end the season with style and trophies! Are you going to end the season with a Deadly Strike and securing your team the trophies? Then get your adidas Deadly Strike boots right here!